The primal flame to really fused jazz and rock? First effort of one of the big 3 fusion bands of the 70's, with WEATHER REPORT and RETURN TO FOREVER, "The Inner Mounting Flame" can be considered as the first record to genuinely combine the raw fury of hard rock with free unconstrained jazz. Of course, funk, jazzy rock or jazz incorporating rock elements have already been heard since the end of the 60's, but I cannot think any other artist went so far in this fusion of genres before. Compared to pioneering records such as Miles Davis' "In a Silent Way" or Frank Zappa's "Hot Rats", "The Inner Mounting Flame" marks a clear evolution. This debut album is a pure magma, an acoustic and electric maelstrom sculpting heavy musical mantras inside mountains. Jazz, rock, blues and Indian ragas find themselves melted together to fuel an unique loud, rapid and mystical fire, with multiple uncommon time signatures and complex rhythms. 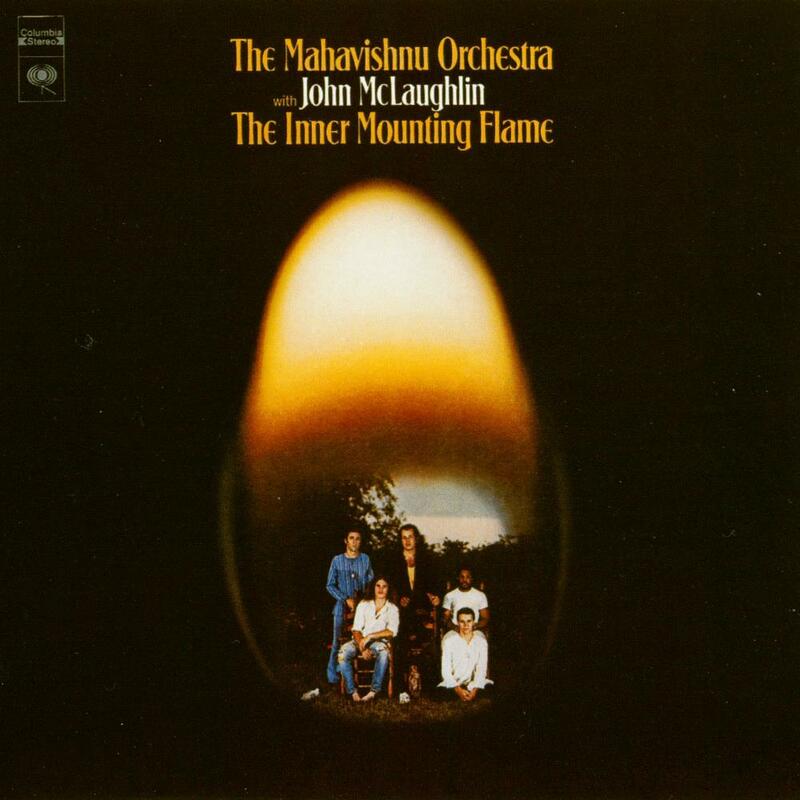 Like most line-ups from this time period, MAHAVISHNU ORCHESTRA's members are all virtuosi in their respective instrument and form a true dream-team: incredible guitarist John McLaughlin, who just spent 2 years at Miles Davis' school to record no less than pioneering albums, organist Jan Hammer, who will later compose Miami Vice theme, whirlwinding violinist Jerry Goodman, bassist Rick Laird and extraordinary drummer Billy Cobham. The fast and spiritual aspects of the music is logical when you know John McLaughlin was the only composer as well as a disciple of the Indian guru Sri Chinmoy. That's certainly where these stylistic choices come from. The disc opens with the incandescent "Meeting Of The Spirits". Violin and drum explodes in a lava of burning guitars. Wow! After all this condensed fury, "Dawn" arrives as a welcomed spacey pause. A calm beautiful jazzy and bluesy kind of ballad. Then appears the raging "Noonward Race". This high-speed delirium jazzy hard-rock can stand for an overboosted jam. In contrast, "A Lotus On Irish Streams" is the perfect soundtrack to wander barefoot in peaceful hanging gardens. A bit mystical and dominated by Jan Hammer's relaxing keyboard textures, this track is a delicate and soothing passage. Back to life with "Vital Transformation", maybe the hottest and grooviest composition of the album. Not really sounding like an ancient Center American ritual, "The Dance Of Maya" starts with a dark oppressive pattern. This first half tends to become a little repetitive though. Then it surprisingly mutates into a heavy blues-rock! The slow desert jam "You Know, You Know" is enjoyable, nonetheless not varied enough. The record finishes in fireworks with its wildest track, "Awakening". A thundering and breathtaking piece, fast-paced, with multiple breaks and corrosive moments. Guitar, bass, violin, keyboards, drums, each musician displays his virtuosity here! As the debut opus of a legendary band, "The Inner Mounting Flame" was already, and still remains nowadays, a true sonic blast, stunning and innovative. Such an advanced mixture of hard rock with complex time signatures in the improvisational jazz mold was never heard at the dawn of the 70's. Simply an essential listen for anyone interested in fusion music. Not the most accessible MAHAVISHNU ORCHESTRA offering, but undoubtedly their rawest!